Following the creation of the Principality of Serbia in 1833, more than half of Serbs in the Balkans were living in the Ottoman Empire or Austrian Empire, which created a situation that allowed for the rise of irredentist ideals. Following the growing nationalistic tendency in Europe from the 18th century onwards, such as the Unification of Italy, Serbia – after first gaining its principality within the Ottoman Empire in 1817 – experienced a popular desire for full unification with the Serbs of the remaining territories, mainly those living in neighbouring entities. The idea of territorial expansion of Serbia originally formulated 1844 in Načertanije, a secret political program of the Principality of Serbia, according to which the new Serbian state could include the neighboring areas of Montenegro, Northern Albania, Bosnia and Herzegovina. 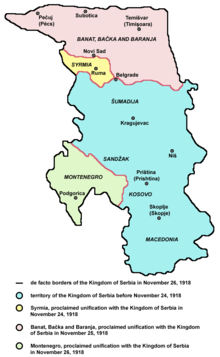 In the early 20th century, all political parties of the Kingdom of Serbia (except for the Social Democratic Party) planning to create a Balkan Federation, generally accepted the idea of uniting all Serbs into one only Serbian state. From the creation of the Principality until the First World War, the territory of Serbia was constantly expanding. 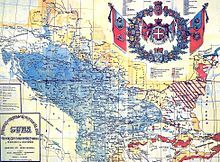 After the end of the Balkan Wars, the Kingdom of Serbia achieved the expansion towards the south, but there was a mixed reaction to the events, for the reason that the promises of lands gaining access to the Adriatic Sea were not fulfilled. Instead, Serbia received the territories of Vardar Macedonia that was intended to become part of the Kingdom of Bulgaria and the Serbian Army had to leave those coastal territories that would become part of the newly formed Principality of Albania. This event, together with the Austro-Hungarian Annexation of Bosnia, frustrated the majority of Serbian politicians, since there was still a large number of Serbs remaining out of the Kingdom. The Serbian victory in the First World War was supposed to serve as compensation to this situation and there was an open debate between the followers of the Greater Serbia doctrine, that defended the incorporation of the parts of the defeated Austro-Hungarian Empire where Serbs lived to Serbia, opposed by the ones that supported an idea of uniting not only all the Serbian lands, but also to include other South Slav nations into a new country. 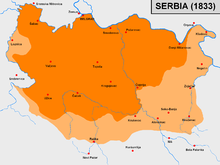 Among other reasons, but also because of the fear of the creation of a bigger and stronger Orthodox Serbia, that could eventually became a Russian allied, the decision of making an ethnically mixed South Slav state, where other nationalities would balance the Serb hegemony, was made. Miloš Milojević's 19th-century map which depicts most of the South Slavs as Serbs. The Serbian Royal family of Karađorđević was set to rule this new state, called Kingdom of Serbs, Croats and Slovenes, that would be renamed to the Kingdom of Yugoslavia in 1929. Initially, the proponents of the Greater Serbia doctrine felt satisfied, since the main goal of uniting all Serbian-inhabited lands under the rule of a Serbian Monarchic dynasty was mostly achieved. During the inter-war period, the majority of Serbian politicians defended a strong centralised country, while their opponents demanded major autonomy for the regions. This tension grew to a point that led to the creation of opposing nationalistic organisations that culminated in the assassination of the King Alexander I in 1934. During the German invasion of Yugoslavia in 1941, these tensions grew to become one of the most brutal civil wars that occurred in World War II. The Royal Government soon capitulated, and the resistance was mainly made by the Četniks, who defended the restoration of the Monarchy, and the Partisans, who supported the creation of a communist Yugoslav state. The Serbs were divided into these two factions, that fought not only Nazi Germany and all the other neighbour Axis allied countries which also invaded different territories of Yugoslavia — the Italians, Hungarians and Bulgarians — but also each other. Beside this, other Yugoslav non-Serb nationalists took advantage of the situation and allied themselves with the Axis countries, regarding this moment as their historical opportunity of fulfilling their own irredentist aspirations, the Independent State of Croatia being by far the most brutal one. After the war, victorious Partisan leader Marshal Josip Broz Tito became the head of state of Yugoslavia until his death in 1980. During this period the country was divided in six republics. In 1976, within the Socialist Republic of Serbia two autonomous provinces, SAP Kosovo and SAP Vojvodina, were created. During this period, most of the Greater Serbian ideology followers were incarcerated as accused of betrayal, or exiled. Within the rest of the Serbian population, the vast majority became strong supporters of this new Non-Aligned Yugoslavia. During the Yugoslav Wars of the 1990s, Serbia stood accused of attempting to create the entity of a Greater Serbia through Belgrade's direct involvement with the unrecognised Serbian entities functioning in Bosnia and Herzegovina and Croatia. The first person to formulate the modern, linguistically based, idea of Pan-Serbism was Dositej Obradović (1739–1811), a writer and thinker who dedicated his writings to the "Slavoserbian people", which he described as "the inhabitants of Serbia, Bosnia, Herzegovina, Montenegro, Dalmatia, Croatia, Syrmium, Banat, and Bačka", and who he regarded as all his "Serbian brethren, regardless of their church and religion". Other proponents of Pan-Serbism included historian Jovan Rajić and politician and lawyer Sava Tekelija, both of whom published works incorporating many of the aforementioned areas under a single umbrella name of "Serbian lands". The concept of Pan-Serbism espoused by these three was not an imperialist one, based upon the notion of Serbian conquest, but a rationalist one. They all believed that rationalism would overcome the barriers of religion that separated the Slavs into Orthodox Christians, Catholics, and Muslims, uniting the peoples as one nation. The idea of a unification and homogenization by force was propounded by Petar II Petrović-Njegoš (1813–1851). 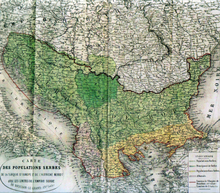 French map of Greater Serbia (1862) with the supposed borders of the medieval Serbian Empire marked in red, and the Serbian populated-areas coloured green, which roughly corresponds to areas inhabited by all South Slavs. Roots of the Greater Serbian ideology are often traced back to Serbian minister Ilija Garašanin's Načertanije (1844). Načertanije (Начертаније) was influenced by "Conseils sur la conduite a suivre par la Serbie", a document written by Polish Prince Adam Czartoryski in 1843 and the revised version by Polish ambassador to Serbia, Franjo Zach, "Zach's Plan". From the 1850s onward, this concept has had a significant influence on Serbian politics. "A plan must be constructed which does not limit Serbia to her present borders, but endeavors to absorb all the Serbian people around her." The work claimed lands that were inhabited by Bulgarians, Macedonians, Albanians, Montenegrins, Bosnians, Hungarians and Croats as part of Greater Serbia. Garašanin's plan also included methods of spreading Serbian influence in the claimed lands. He proposed ways to influence Croats and Slavic Muslims, who Garašanin regarded as "Serbs of Catholic faith" and "Serbs of Islamic faith". This plan was kept secret until 1967 and has been interpreted by some as a blueprint for Serbian national unification, with the primary concern of strengthening Serbia's position by inculcating Serbian and pro-Serbian national ideology in all surrounding peoples that are considered to be devoid of national consciousness. The most notable Serbian linguist of the 19th century, Vuk Karadžić, was a follower of the view that all south Slavs that speak the Shtokavian dialect (of Serbo-Croatian) were Serbs, speaking the Serbian language. As this definition implied that large areas of continental Croatia, Dalmatia, and Bosnia and Herzegovina, including areas inhabited by Roman Catholics – Vuk Karadžić is considered by some to be the progenitor of the Greater Serbia program. More precisely, Karadžić was the shaper of modern secular Serbian national consciousness, with the goal of incorporating all indigenous Shtokavian speakers (Eastern Orthodox, Catholic, Muslim) into one, modern Serbian nation. Shtokavian dialect, whose speakers Vuk considered Serbs in the 19th century. There are at least 5 million people who speak the same language, but by religion they can be split into three groups ... Only the first 3 million call themselves Serbs, but the rest will not accept the name. This view is not shared by Andrew Baruch Wachtel (Making a Nation, Breaking a Nation) who sees him as a partisan of South Slav unity, albeit in a limited sense, in that his linguistic definition emphasized what united South Slavs rather than the religious differences that had earlier divided them. However, one might argue that such a definition is very partisan: Karadžić himself eloquently and explicitly professed that his aim was to unite all native Shtokavian speakers whom he identified as Serbs. Therefore, Vuk Karadžić's central linguistic-political aim was the growth of the realm of Serbdom according to his ethnic-linguistic ideas and not a unity of any sort between Serbs and the other nations. Greater Serbian aspirations before the Balkan wars 1912–1913, according to the Report of the International Commission to Inquire into the Causes and Conduct of the Balkan Wars. ...for economic independence, Serbia must acquire access to the Adriatic Sea and one part of the Albanian coastline: by occupation of the territory or by acquiring economic and transportation rights to this region. This, therefore, implies occupying an ethnographically foreign territory, but one that must be occupied due to particularly important economic interests and vital needs. Serbia gained significant territorial expansion in the Balkan Wars and almost doubled its territory, with the areas populated mostly by non-Serbs (Albanians, Bulgarians, Turks and others). :159–164 Serbia's most important goal of the Balkan Wars was access to the open sea. so the Kingdom of Serbia occupied most of the interior of Albania and Albania's Adriatic coast. A series of massacres of Albanians in the Balkan Wars were committed by the Serbian and Montenegrin Army. According to the Report of the International Commission on the Balkan Wars, Serbia consider annexed territories "as a dependency, a sort of conquered colony, which these conquerors might administer at their good pleasure". Newly acquired territories were subjected to military government, and were not included in Serbia's constitutional system. The opposition press demanded the rule of law for the population of the annexed territories and the extension of the constitution of the Kingdom of Serbia to these regions. The Royal Serbian Army captured Durazzo (Albanian: Durrës) on 29 November 1912 without any resistance. Orthodox Christian metropolitan of Durrës Jakob gave a particularly warm welcome to the new authorities. Due to Jakob's intervention to the Serbian authorities several Albanian guerrilla units very saved and avoided execution. However, the army of the Kingdom of Serbia retreated from Durrës in April 1913 under pressure of the naval fleet of Great Powers, but it remained in other parts of Albania for the next two months. The secret military society called Unity or Death, popularly known as the Black Hand, headed by Serbian colonel Dragutin Dimitrijević Apis, which took an active and militant stance on the issue of a Greater Serbian state. This organization is believed to have been responsible for numerous atrocities following the Balkan Wars in 1913. In 1914, Young Bosnia member Gavrilo Princip assassinated Archduke Franz Ferdinand in Sarajevo, which set off an international crisis that led to the First World War. 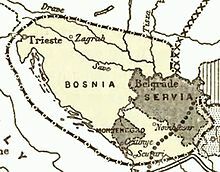 In late November 1918, at the end of the First World War, Syrmia, Banat, Bačka and Baranja, and Montenegro proclaimed its unification with the Kingdom of Serbia and entered into Yugoslavia as part of Serbia (Note: the map shown – Bačka, Banat, Baranja – represents a short time period, during military demarcation, not the actual unified territory). By 1914 the Greater Serbian concept was eventually replaced by the Yugoslav Pan-Slavic movement. The change in approach was meant as a means to gain support of other Slavs which neighboured Serbs who were also occupied by Austria-Hungary. The intention to create a south Slav or "Yugoslav" state was expressed in the Niš declaration by Serbian prime minister Nikola Pašić in 1914, as well as in Serbia's regent Alexander's statement in 1916. The documents showed that Serbia would pursue a policy that would integrate all territory that contained Serbs and southern Slavs (except Bulgarians), including Croats and Slovenes. 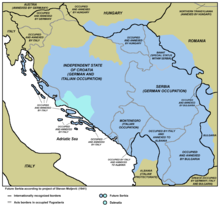 The Treaty of London (1915) of the allies would assign to Serbia the territories of Bosnia and Herzegovina, Srem, Bačka, Slavonia (against Italian objections) and northern Albania (to be divided with Montenegro). After the First World War, Serbia achieved a maximalist nationalist aspirations with the unification of the south Slavic regions of Austria-Hungary and Montenegro, into a Serbian-dominated Kingdom of Yugoslavia. 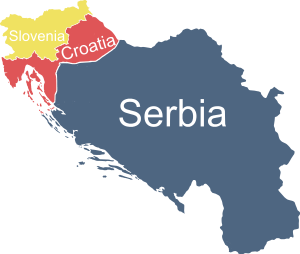 The Allies agreed to give the lands of Slovenia, Croatia, and Bosnia and Herzegovina to Serbia. At this time Montenegro had already been annexed by Serbia. Serbian and Yugoslav nationalists claimed that the peoples' had few differences and were only separated by religious divide imposed by occupiers. It was under this belief that Serbia believed the large annexations would be followed by assimilation. 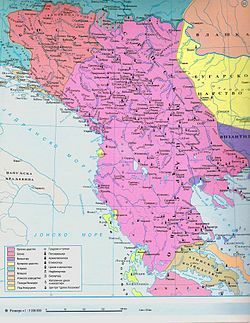 During the Kingdom of Serbs, Croats and Slovenes, the government of the Kingdom pursued a linguistic Serbisation policy towards the Macedonians in Macedonia, then called "Southern Serbia" (unofficially) or "Vardar Banovina" (officially). The dialects spoken in this region were referred to as dialects of Serbo-Croatian. Either way, those southern dialects were suppressed with regards education, military and other national activities, and their usage was punishable. The concept of "Greater Serbia" was put in practice during the early 1920s, under the Yugoslav premiership of Nikola Pašić. Using tactics of police intimidation and vote rigging, he diminished the role of the oppositions (mainly those loyal to his Croatian rival, Stjepan Radić) to his government in parliament, creating an environment to centralization of power in the hands of the Serbs in general and Serbian politicians in particular. During the World War II, the Serbian royalist Yugoslav Army in the Fatherland headed by General Draža Mihailović attempted to define its vision of a postwar future. One of its intellectuals was the Bosnian Serb nationalist Stevan Moljević who, in 1941, proposed in a paper entitled "Homogenous Serbia" that an even larger Greater Serbia should be created, incorporating not only Bosnia and much of Croatia but also chunks of Romania, Bulgaria, Albania and Hungary in areas where Serbs don't represent a significant minority. In the territories under their military control, Chetniks applied a policy of ethnic cleansing against ethnic Croats and Bosnian Muslims. The Serbs today have a primary and basic duty – to create and organize a homogeneous Serbia which must consist of the entire ethnic territory on which the Serbs live. It was a point of discussion at a Chetnik congress held in village Ba in central Serbia in January 1944; however, Moljević's ideas were never put into practice due to the Chetniks' defeat by Josip Broz Tito's Partisans (a predominantly Serb movement which became multi-ethnic by this time) and it is difficult to assess how influential they were, due to the lack of records from the Ba congress. Nonetheless, Moljević's core idea—that Serbia is defined by the pattern of Serb settlement, irrespective of existing national borders—was to remain an underlying theme of the Greater Serbian ideal. Yugoslavia is a Croatian-Slovene hegemony, in order to reduce the Serbs to a smaller representative group, or "power-sharing". Serbs are, in Yugoslavia, oppressed as a nation. This oppression is especially brutal in Serbian Autonomous Province of Kossovo-Metochia, and in Croatia, where their status is "the worst ever as far as recorded history goes". Serbia is economically exploited, being subjected to the political-economical mechanisms that drain much of her wealth and redistribute it to Slovenia, Croatia and Kosovo-Metohija. 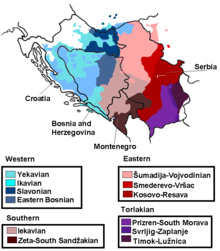 borders between Yugoslav republics are arbitrary, drawn by dominant Croatian and Slovene communists (motivated, supposedly, by anti-Serbian animus) and their Serbian political lapdogs. With the rise to power of Milošević the Memorandum's discourse became mainstream in Serbia. According to Bennett, Milošević used a rigid control of the media to organize a propaganda campaign in which the Serbs were the victims and stressed the need to readjust Yugoslavia due to the alleged bias against Serbia. This was then followed by Milošević's anti-bureaucratic revolution in which the provincial governments of Vojvodina and Kosovo and the Republican government of Montenegro, were overthrown giving Milošević the dominating position of four votes out of eight in Yugoslavia's collective presidency. Milošević had achieved such a dominant position for Serbia because, according to Bennett, the old communist authorities had failed to stand up to him. During August 1988, supporters of the Anti-Bureaucratic Revolution were reported to have shouted Greater Serbia themed chants of "Montenegro is Serbia!". Croatia and Slovenia denounced the demands by Milošević for a more centralized system of government in Yugoslavia and they began to demand that Yugoslavia be made a full multi-party confederal state. Milošević claimed that he opposed a confederal system but also declared that should a confederal system be created, the external borders of Serbia would be an "open question", insinuating that his government would pursue creating a Greater Serbia if Yugoslavia was decentralized. Major changes took place in Yugoslavia in 1990 when free elections brought opposition parties to power in Croatia and Slovenia. The Virovitica–Karlovac–Karlobag line is a hypothetical boundary that describes the western extent of an irredentist nationalist Serbian state. It defines everything east of this line, Karlobag–Ogulin–Karlovac–Virovitica, as a part of Serbia, while the west of it would be within Slovenia, and all which might remain of Croatia. Such a boundary would give the majority of the territory of the Socialist Federal Republic of Yugoslavia to the Serbs. This line was frequently referenced by Serbian politician Vojislav Šešelj. The line is based on the failed 1915 Treaty of London. Also, it would gather over 98% of Serbs of Yugoslavia in one state. In his speeches and books, Šešelj claimed that all of the population of these areas are in fact ethnic Serbs, of Orthodox, Roman Catholic or Muslim faith. However, outside of Šešelj's Serbian Radical Party, the line as such was never promoted in recent Serbian political life. The distribution of Serbs and Montenegrins in Yugoslavia in 1981. Territories of the Republic of Bosnia and Herzegovina and the Republic of Croatia controlled by Serb forces 1992–1995. Milošević believes he now has the historic opportunity to, once and for all, settle accounts with the Croats and do what Serbian politicians after World War I did not – rally all Serbs in one Serbian state. —  Belgrade newspaper Borba, August 1991. During the Yugoslav wars of the 1990s, the concept of a Greater Serbia was widely seen outside of Serbia as the motivating force for the military campaigns undertaken to form and sustain Serbian states on the territories of the breakaway Yugoslav republics of Croatia (the Republic of Serbian Krajina) and Bosnia and Herzegovina (the Republika Srpska). From the Serb point of view, the objective of this policy was to assure Serbs' rights by ensuring that they could never be subjected to potentially hostile rule, particularly by their historic Croatian enemies (cf. Ustaše). The war crimes charges against Milošević are based on the allegation that he sought the establishment of a "Greater Serbia". Prosecutors at the Hague argued that "the indictments were all part of a common scheme, strategy or plan on the part of the accused [Milošević] to create a 'Greater Serbia', a centralized Serbian state encompassing the Serb-populated areas of Croatia and Bosnia and all of Kosovo, and that this plan was to be achieved by forcibly removing non-Serbs from large geographical areas through the commission of the crimes charged in the indictments. Although the events in Kosovo were separated from those in Croatia and Bosnia by more than three years, they were no more than a continuation of that plan, and they could only be understood completely by reference to what had happened in Croatia and Bosnia." The Hague Trial Chamber found that the strategic plan of the Bosnian Serb leadership consisted of "a plan to link Serb-populated areas in BiH together, to gain control over these areas and to create a separate Bosnian Serb state, from which most non-Serbs would be permanently removed". It also found that media in certain areas focused only on Serb Democratic Party policy and reports from Belgrade became more prominent, including the presentation of extremist views and promotion of the concept of a Greater Serbia, just as in other parts of Bosnia and Herzegovina the concept of a Greater Croatia was openly advocated. Questionable historical justifications for claims to territory; for instance, during the Croatian War of Independence, Dubrovnik and other parts of Dalmatia were claimed as a historically Serbian territory — claims which were opposed by Croatian authorities, and by high-profile international governments. The coercive nature of creating a Greater Serbian state against the will of other nations; before the wars, the peoples of Yugoslavia were highly intermingled and it was physically impossible to create ethnic states without taking in large numbers of other ethnic groups against their will. An answer to this was the widespread use of ethnic cleansing to ensure that mono-ethnic territories could be established without opposition from potentially disloyal minority groups. A converse argument is used against the upgrading the status of Croatia and of Bosnia and Herzegovina from republics to independent states—taking in large numbers of other ethnic groups against their will in the process. Vuk Draskovic, leader of the Serbian Renewal Movement, called for the creation of a Greater Serbia which would include Serbia, Kosovo, Vojvodina, Macedonia and Montenegro, as well as regions within Bosnia and Herzegovina and Croatia with high concentrations of Serbs. Jovan Marjanovic of the Serbian Renewal Movement asked that "the Yugoslav Army must come into Croatia and occupy the line Benkovac–Karlovac–Pakrac–Baranja". About 160,000 Croats were expelled from territories Serbian forces sought to control. Much of the fighting in the Yugoslav Wars of the 1990s was the result of an attempt to keep Serbs unified. Mihajlo Markovic, the Vice President of the Main Committee of Serbia's Socialist Party, rejected any solution that would make Serbs outside Serbia a minority. He proposed establishing a federation consisting of Serbia, Montenegro, Bosnia and Herzegovina, Macedonia and Serbs residing in the Serbian Autonomous Region of Krajina, Slavonia, Baranja, and Srem. Vojislav Šešelj, president of the Serbian Radical Party, is one of the staunchest advocates of Greater Serbia. The military defeat of the Republic of Serbian Krajina, the creation of the Republika Srpska within a sovereign Bosnia, the UN Administration of Kosovo, the retreat of Serbs from their formerly controlled territories in Croatia, Bosnia, and Kosovo and the indictment of some Serbian leaders for war crimes have greatly discredited the Greater Serbian ideal in Serbia as well as abroad. Western countries claim that atrocities of the Yugoslav Wars have prompted them to take a much stronger stance against the Greater Serbian goal. So I say: if a Greater Serbia should be held by committing crime, I would never accept it; may Greater Serbia disappear, but to hold it by crime – no. If it were necessary to hold only a small Serbia by crime, I would not accept it. May small Serbia disappear, but to hold it by crime – no. And if there is only one Serb, and if I am that last Serb, to hold on by crime – I do not accept. May we disappear, but disappear as humans, because then we will not disappear, we will be alive in the hands of the living God. Slobodan Milošević and many other Serb leaders were accused by the International Criminal Tribunal for the Former Yugoslavia (ICTY) of crimes against humanity including murder, forcible population transfer, deportation and "persecution on political, racial or religious grounds". Tribunal prosecutor's office has accused Milosevic of "the gravest violations of human rights in Europe since the Second World War and genocide." Milošević died in prison before sentencing. However, the idea of a Greater Serbia is still seen by many Croats, Bosniaks, and Albanians as a barrier to good relations and unity between Serbs and other neighbouring peoples. In 2008, Aleksandar Vučić, a former member of the Serbian Radical Party, which advocated for a Greater Serbia, declared that the Greater Serbian project was unrealistic. Currently, there is a movement calling for the unification of Republika Srpska with Serbia. The Bosniaks and Croats see this as an act of breaking the Dayton Agreement, while Serbs see it as an example of self-determination. ^ "Ilija Garasanin's "Nacertanije": A Reasessment". Rastko.org.rs. Archived from the original on 2014-01-07. Retrieved 2010-08-04. ^ Banac 1988, p. 110. ^ Thiers, Henri (1862). La Serbie: Son Passé et Son Avenir. Dramard-Baudry. ^ a b c d Cohen 1996, p. 3. ^ Trencsényi, Balázs (2006). Discourses of Collective Identity in Central and Southeast Europe (1770–1945), Texts and Commentaries, Volume I. Central European University Press. p. 240. ISBN 963-7326-60-X. ^ a b Cohen 1996, pp. 3–4. ^ Danijela Nadj. "Vuk Karadzic, Serbs All and Everywhere (1849)". Hic.hr. Retrieved 2010-08-04. ^ a b c d e f g Carnegie Endowment for International Peace (1914). Report of the International Commission to Inquire into the Causes and Conduct of the Balkan War. Carnegie Endowment for International Peace. ^ Danijela Nadj. "Jovan Cvijić, Selected statements". Hic.hr. Retrieved 2010-08-04. ^ Petros-Emmanouil, Oikonomopoulos,; Πέτρος-Εμμανουήλ, Οικονομόπουλος, (2016). "Ο Μητροπολίτης Μυτιλήνης Ιάκωβος ο από Δυρραχίου: από την Εθναρχούσα Εκκλησία στην Εθνική" (in Greek). Αριστοτέλειο Πανεπιστήμιο Θεσσαλονίκης (ΑΠΘ). Σχολή Θεολογική. Τμήμα Θεολογίας. Τομέας Εκκλησιαστικής Ιστορίας, Χριστιανικής Γραμματείας Αρχαιολογίας και Τέχνης. p. 80. ^ Antić, Čedomir (January 2, 2010). "Kratko slavlje u Draču" [Short celebration in Durres]. Večernje novosti (in Serbian). Retrieved August 5, 2011. VeĆ u aprilu 1913. postalo je izvesno da je kraj "albanske operacije" blizu. Pod pritiskom flote velikih sila srpska vojska je napustila jadransko primorje. U Albaniji je, međutim, ostala još dva meseca... In April 1913 it was obvious that end of "Albanian operation" was close and army of Serbia retreated from Adriatic coast remaining in Albania for two more months. ^ Richard C Hall, The Balkan Wars 1912–1913. Books.google.com. Retrieved 2010-08-04. ^ Littlefield, Walter (1922-04-16). "Montenegrins' Effort to Prevent Annexation of Their Country to Serbia" (PDF). New York Times. Retrieved 2010-08-04. ^ "Serbs wipe out royalist party in Montenegro". Archived from the original on 2010-03-02. Retrieved 2010-08-04. ^ "An article by Dimiter Vlahov about the persecution of the Bulgarian population in Macedonia". newspaper "Balkanska federatsia", No. 140, Aug.20, 1930, Vienna, original in Bulgarian. Retrieved 2007-08-03. ^ Friedman, V (1985). "The sociolinguistics of literary Macedonian". International Journal of the Sociology of Language. 52: 31–57. doi:10.1515/ijsl.1985.52.31. ^ "By the Shar Mountain there is also terror and violence". newspaper "Makedonsko Delo", No. 58, Jan. 25, 1928, Vienna, original in Bulgarian. Retrieved 2007-08-03. ^ Malcolm, Noel (1996). Bosnia: A Short History. New York University Press. p. 188. ISBN 0-8147-5561-5. ^ Lampe, John R. (2000). Yugoslavia as History. Cambridge University Press. pp. 206, 209, 210. ISBN 0-521-77401-2. ^ Glenny, Misha (2001). The Balkans: Nationalism, War & the Great Powers, 1804–1999. Penguin Books. pp. 494–495. ISBN 0-14-023377-6. ^ Danijela Nadj. "Stevan Moljevic, Homogeneous Serbia (1941)". Hic.hr. Retrieved 2010-08-04. ^ a b c Bennett, Christopher (1995). Yugoslavia's Bloody Collapse: Causes, Course and Consequences. C. Hurst & Co. Publishers. ISBN 1-85065-232-5. ^ Cigar, Norman (1995). Genocide in Bosnia: The Policy of "Ethnic Cleansing". Texas A&M University Press. ISBN 0-89096-638-9. ^ Ramet 2006, pp. 351. ^ Ramet 2006, pp. 355. ^ Ramet 2006, pp. 359. ^ a b c d Bassiouni, Cherif (28 December 1994). "Final Report of the Commission of Experts Established Pursuant to Security Council Resolution 780". United Nations. Archived from the original on 4 May 2012. Retrieved 10 May 2010. ^ a b Gow, James (1997). Triumph of the Lack of Will: International Diplomacy and the Yugoslav War. C. Hurst & Co. Publishers. ISBN 1-85065-208-2. ^ "Granice (srpske)". Biografija :: Pojmovnik (in Serbian). Vojislav Šešelj official website. April 1992. Retrieved 2012-12-21. Srpske granice dopiru do Karlobaga, Ogulina, Karlovca, Virovitice. ^ "Case information sheet" (PDF). (IT-03-67) Vojislav Šešelj trial. ICTY. Retrieved 2012-12-21. He defined the so-called Karlobag-Ogulin-Karlovac-Virovitica line as the western border of this new Serbian state which he referred to as "Greater Serbia" and which included Serbia, Montenegro, Macedonia and considerable parts of Croatia and Bosnia and Herzegovina. ^ Međimorec, Miroslav (September 2002). "Footnotes" (PDF). National security and the future. Zagreb, Croatia: St. George Association / Udruga sv. Jurja. 3 (3–4). ISSN 1332-4454. Archived from the original on 2012-12-21. Retrieved 2012-12-21. 8. "The Virovitica-Karlovac-Karlobag line" – the amputation line which was intended to come into being by the imposed Yugoslav king Alexander after the assassination of Croatian national tribune Stjepan Radić in 1928. The remains of thus amputated Croatia "would be seen from the Zagreb Cathedral's tower". That line is also mentioned in Četniks' plans during WW2 (Moljević, Dražža Mihajlović), the line mentioned by Serb radical politicians (Šešelj) and by the JNA military strategists as the western border of "Greater Serbia". ^ "Converting the Army". Vreme New Digest Agency (in Serbian) (3). 1991-10-14. Retrieved 2012-12-21. The projected future frontiers of the "Great Serbia" are derived from the recent Army offensives and extrapolated from the public statements of Serbian politicians known to be "the mouthpiece of Milosevic". [...] The line Karlovac–Virovitica incidentally covers the only oilfields in Yugoslavia. The entire Slavonia represents probably the best agricultural soil in Europe. ^ "Prosecutor v. Radoslav Brđanin – Judgement" (PDF). United Nations International Criminal Tribunal for the former Yugoslavia. 2007-04-03. Retrieved 2009-11-03. ^ "Prosecutor v. Duško Tadić – Judgement" (PDF). United Nations International Criminal Tribunal for the former Yugoslavia. 1997-07-14. Retrieved 2009-11-03. ^ International Centre Against Censorship. "Forging War: The Media in Serbia, Croatia and Bosnia-Herzegovina". International Centre Against Censorship, Article 19. Avon, United Kingdom: Bath Press, May 1994. P79. ^ a b Smydo, Joe (2004-08-29). "Atrocities in Yugoslavia unraveled much later". Post-gazette.com. Retrieved 2010-08-04. ^ "Interview with Patriarch Pavle (Serbian)". Dverisrpske.com. Retrieved 2010-08-04. ^ David Bruce MacDonald, Balkan holocausts? : Serbian and Croatian victim-centred propaganda. Books.google.com. p. 106. Retrieved 2010-08-04. ^ "Vučić sad nije za veliku Srbiju". Blic Online. Retrieved 30 August 2011. Greater Serbia: from ideology to aggression. Croatian Information Centre. 1993. Sinisa Malesevic (11 January 2013). Ideology, Legitimacy and the New State: Yugoslavia, Serbia and Croatia. Routledge. ISBN 978-1-136-34176-2. Charles Jelavich (1983). Serbian textbooks: toward greater Serbia or Yugoslavia. Anzulovic, Branimir (1999). Heavenly Serbia: From Myth to Genocide. New York University Press. ISBN 0-8147-0671-1. Philip J. Cohen; David Riesman (1996). Serbia's Secret War: Propaganda and the Deceit of History. Texas A&M University Press. ISBN 978-0-89096-760-7. Ramet, Sabrina P. (2006). The Three Yugoslavias: State-Building and Legitimation, 1918–2005. Bloomington, IN: Indiana University Press. ISBN 978-0-253-34656-8. Ivo Banac (2015) . The National Question in Yugoslavia: Origins, History, Politics. Cornell University Press. ISBN 978-1-5017-0193-1. Banac, Ivo (1988). Nacionalno pitanje u Jugoslaviji: porijeklo, povijest, politika. Globus. Wikimedia Commons has media related to Greater Serbia.